Arguably, the most memorable 5 days feast around Senegal. I traveled with writer Alexandra Marshall and photographer Jonas on an assignment for the Wall Street Journal. The article was inspired by the 10-days institute I was hosting in collaboration the West African Research Association of Boston University. Our first stop was Dakar. Here we enjoyed local food for lunch at Djembe. We shared a delicious Thiebou Diola, which consist of a grilled fish served with rice, fermented locust bean (netetou), dried clams, sorrel and okra purée (baguedj) and fresh palm oil with marinated onions. In the evening we visited L'Endroit, a hip Cameroonian restaurant. The following morning, we departed at early sunrise for Djilor, a peaceful Serer village on the bank of the Saloum River delta. While in Djilor, we also visited a women cooperative that specializes in millet processing. Djilor is only 30 minutes from Joal, a fisherman's village that has become Senegal's largest artisanal fishing port. Everyday, between 6 pm and midnight there is a continuous stream of colorful wooden boats arriving to the hors of Joal. Fishermen unloading their nets. Women bargaining and carrying huge bowls of fresh fish that they will bring to the market. We saw the fermentation process of conch (guedj) and sea snails (Touffa) and we watched the process of smoking "kethiakh", a bony fish similar to sardine. The smoking activity seemed to be divided by gender. The men fetch the stalks and straws and tend to the fire. Artisanal smokers, made of rectangular brick structures, stretch several meters long. Hundreds of fish are salted and arranged in neat row o a grill over the smoking straws. After several hours of smoking then cooling, the women clean the fish of their burnt skin and arrange them for the market. After Djilor and Joal, we visited the Artisanal salt production of the Pink Lake. The Pink Lake is an amazing natural phenomenon. During the dried season, on sunny and windy days, the lake turns a beautiful pink coloration. The main industry in the area is the artisanal salt production. The salt content of the Pink lake is even higher than the Dead Sea. About an hour from the Pink Lake is the monastery of Keur Moussa where Benedictine monks opened their door to their wonderful orchard where grapefruits, mandarins, tamarind or papaya grow in abundance. Then we took a plane an hour south to Casamance. Right in the beginning of oyster season (starts in mid-February). We took a small dugout boat on the Casamance River to collect fresh oysters from the mangrove. In Casamance, we grill them on a wood burning, then shuck them with their precious nectar, and mix it it with lemon juice, raw onion and habanero. This dish called tempra is like a sevice with a combination of smokiness for the wood, brininess fro the oysters nectar and acidity fro the lemon, combined with the heat of the habanero and the crunchy rawness of the onions, makes a most refreshing and good tasting oyster salad. This grilled oysters salad is often served as an appetizer with fresh palm wine. In Casamance we also ate a rich etodjay prepared by my cousin Binta. Etodjay is a specialty of the Diola people. It contains cassava leaves, ground peanuts and a rich medley of seafood that included, crab, shrimp, smoked oysters, dried clams all cooked in a exquisite stew with red palm oil. After Casamance, we went to the northern region of St Louis, the birthplace of Thiebou Jenn, Senegal national dish. In St Louis we stayed at one of my favorite Maison d'Hote in the whole world, Au Fil du Fleuve" (http://fildufleuve.com), owned by the most charming host (and talented cook) Marie Caroline Camara. Soda prepared for us a delicious thiebou jenn while Marieme, the manager as well as an art student and a blogger, entertained us with food stories of Saint louis. Is Red Palm Oil Healthful or Harmful to Your Health? Read my recent article on blah site to find out. “Rumble in the Jungle” refers to the legendary boxing fight between Muhammad Ali and George Foreman, which took place on November 2,1974, in Kinshasa. I was still a little boy, but I have vivid memories of the thunderous roar of joy that, no doubt, traveled across the entire African continent when Foreman collapsed in the ring. George Foreman’s defeat was a defining moment of my generation and one of my earliest childhood memories. I remember watching it live with my dad and siblings on our grainy, black-and-white TV screen. It was 4 a.m. in Dakar and probably the first time I was allowed to stay up so late! Almost exactly 40 years later, on November 1st, 2014, I arrived in Kinshasa to prepare a dinner at the Kempinski Hotel. 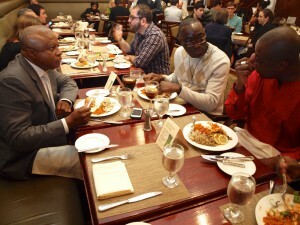 The dinner was for delegates of the Food & Agriculture Organization (FAO) and the African Union (AU). The theme of the dinner was: “Neglected and Underutilized Species of Africa” — I was to plan my menu around indigenous African crops. 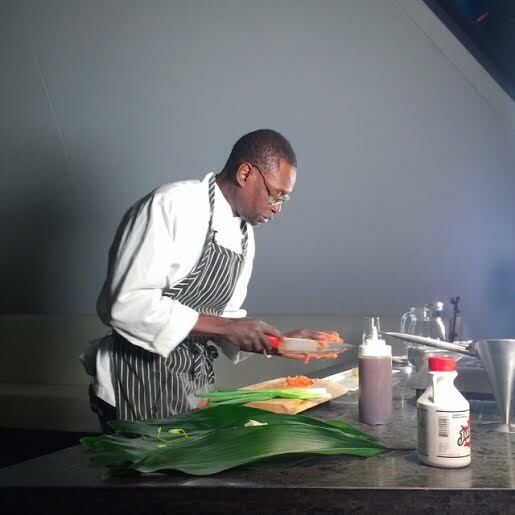 As part of the first annual NY Travel Festival, Chef Pierre Thiam will be hosting a special three-course cooking class on West African cuisine for VIP festival goers. The VIP package also includes admission to the main festival on Saturday, April 20 and a Mexican cultural tour on Sunday, April 21. Cooking class: April 20 from 10:30 a.m. to 1:30 p.m. The inaugural New York Travel Festival weekend will take place April 20-21, 2013. Tickets are now on sale. On Saturday, we’ll be at Bohemian National Hall, featuring an array of speakers, panelists, tastings, and other experiences. On Sunday, there will be a variety of opportunities to experience local and international culture by venturing out into New York City’s varied neighborhoods and boroughs. Our goal is to reinvent the consumer travel show for a crowd seeking more interaction and a better sense of NYC and beyond. 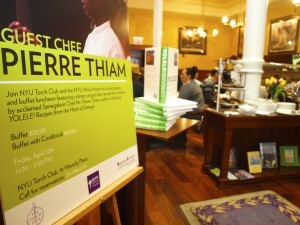 On April 12, NYU Africa House and NYU Torch Club hosted a book signing and buffet luncheon with Pierre Thiam, who showcased dishes from around the African continent. 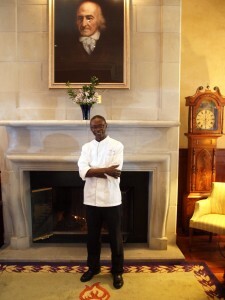 Thiam signed for fans copies of his award-winning cookbook, Yolele! Recipes from the Heart of Senegal. Photos from the book signing included below. The event was held in conjunction with the Africa House Conference, whose theme was “People, Food & Globalization: Perspectives on the Production, Trade and Consumption of Food in Africa & Beyond” featuring speakers Dr. Marco Polo Hernandez-Cuevas, Prof. of Spanish and Afro-Hispanic Studies, North Carolina Central University; Dr. Jessica Harris, culinary historian; and Yaw Nyarko, professor of economics at NYU. NYU Africa House is an interdisciplinary institute at New York University devoted to the study of contemporary Africa, focusing on Political, Social, and Economic issues. To learn more, visit nyuafricahouse.org.